I got a NASAgram about a nice collection of sky objects that will be visible in the southwest at sunset tonight. The moon will be a very thin crescent and only visible very close to the horizon just before it sets, Venus will be nearby and very bright, and Jupiter will be high and bright a bit to the east. 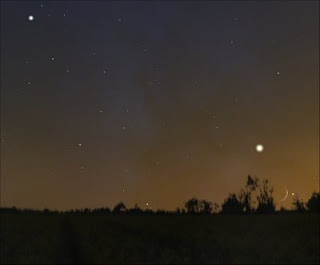 This picture is from Stellarium. The NASA page has sky diagrams for tonight and for several other sky shows in the next few weeks. I won't see this since I'll be on a plane over the Atlantic at that time, en route to Frankfurt and finally Salzburg. With regular work stuff, preparations for the trip, making phone calls to New Hampshire for Obama, and other campaign distractions, I haven't paid much attention to space and astronomy developments, let alone written about them. After this trip and the election, I'm hoping to get back into the swing of things. Although he hasn't been elected yet, plenty of experts are already dispensing advice to our next president. The new Newsweek has a cover story about all the problems facing the new president, "Nightmare on Pennsylvania Avenue." It includes NY Mayor Michael Bloomberg's advice on the economy, among other things. MIT Technology Review also has a "Dear Mr. President" article with expert advice on the topics of energy and electronic information systems for health care, and an especially important memo on research from Charles M. Vest, President of the National Academy of Engineering. He says we need to invest in education, research, and innovation, and he gives some specific steps we need to take to accomplish this. None of these articles speculates on who we will elect next Tuesday. I really hope it's Barack Obama, and even though the polls are looking good and the Democrats are taking many precautions against election fraud, I'm sure the GOP is still working on ways to steal this election as they stole the 2000 election. Like many Obama supporters, I'm a bit stressed about this! There's not much I can do about it, though I am continuing to make phone calls every evening to voters in New Hampshire. This helps to refine the Obama databases in preparation for the final get out the vote effort starting this weekend. I wish I could volunteer in New Hampshire for the final four days, but instead I will be in Europe on business. So I am signing up a few loved ones to go to NH instead of me. I hope Obama's victory doesn't hang on those four electoral votes, but I want them to be there if he does need them! On Friday I'm heading to Salzburg, Austria where I will teach a seminar next week. I've been to Salzburg two or three times before, the first time in the late 1980's during my "heavy Mozart" phase. The 1984 movie Amadeus sparked my initial interest in Mozart (I first saw it in Japan in 1985), and Mozart's music was nearly an obsession for a while. I was lucky to be able to feed that obsession by visiting the Mozart Gerburtshaus (birthplace) in Salzburg and even attending a chamber music concert in the concert hall of the Residenz (the archbishop's palace, where young Mozart had performed many times). I also collected many Mozart CD's (but not quite the complete works). So now I'm doing a little Mozart re-immersion in preparation for the trip, ripping a few more of my Mozart CD's so I can listen to my own Mozart soundtrack on my iPod as I wander the city next weekend. While doing this, I rediscovered my special affinity for Mozart pieces in the key of G minor. He didn't often compose in that key, and when he did, the music tended to be energetic and defiant more than sad or moody as many minor key musical works can seem. I especially like Symphony No. 25 (K.183, the "little" G minor, whose first movement is used in the opening scene of Amadeus), the Piano Quartet in G minor (K.478), the String Quintet in G minor (K.516), and Symphony No. 40 (K.550), the second of his final three symphonies, all amazingly composed in 1788. There's nothing to compare with seeing the night sky with your own eyes (given a clear night, suitable optics to help you see things better, and a human or other guide to help you understand what you're seeing). But thanks to the internet, there are other options that let you explore the night sky through your computer screen. Some amateurs such as Rob Gendler make magnificent use of digital night sky images captured with remote controlled telescopes. There are "pay per view" sites with elaborate interfaces, multiple large telescopes in good viewing locations, guided tours, and more (Slooh is probably the best known). I found a free service that is not so elaborate but is an interesting place to start. 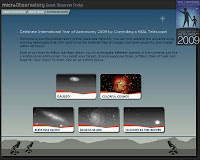 It's the Micro Observatory Online Telescopes offered by the Harvard-Smithsonian Center for Astrophysics. Although this is an educational project aimed at teachers who will use the telescopes to enrich science education for grade 6-12 students, there is also an all-access "guest observer portal." The telescopes aren't very large, but they let you do some interesting things, though somewhat indirectly. I tried this out the other day and received my first few images today. Basically this is telescope "batch processing" with a limited number of pre-defined observations that you can request, and a few "decisions" you have to make about the observations. For the Andromeda Galaxy shown above, I had to choose the exposure time (but it tells you if you choose the wrong one). For Jupiter and its moons (recreating Galileo's first telescope observations from January 1610), I just had to request a number of observations (up to 5 to be taken at different times, so you can see the moons' positions change). I made my requests, gave an email address, and two days later I received my images by email, with links to more detailed information online. I was lucky and skies were clear last night. The images come back as GIF files but you can also download your images in FITS format (an astronomical image format that preserves more image data). To work with FITS, you can also download a free astronomical image processing application (written in Java). 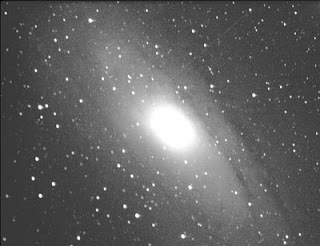 For the image above, I used this program to play around with the contrast, exported the result as GIF, opened in PaintShop Pro, increased the color depth (to allow more image manipulation), and played further with the contrast to bring out the arms of the Andromeda Galaxy. For some reason, I didn't receive all the Jupiter moon images I requested, so I didn't try out the option of making a stacked image and saving it as an animated GIF. I'll have to try again. There's much more to explore here. While there are relatively few objects to grab, there's good background material to help you understand what you're seeing, and there are hands-on possibilities for learning to manipulate astronomical images. Rob Gendler, watch your back! It's hard to beat this video for a feel-good message of diversity and hope - it's an Obama zydeco music video from the Cajun country of Louisiana. "Oui, on peut" of course means "yes we can." I also want to point out another very moving video, featuring Maya Soetoro-Ng, Barack Obama's half sister, talking briefly about their mother. She says that their story is "a quintessentially American story." The video is under three minutes but I think it says a lot about the roots of who Obama is. This video clip is the final 5 minutes or so of a speech that Barack Obama gave the other day at a rally in Richmond, Virginia. He talks about what a serious time this is and about how the huge problems we now face require a united America, not the divisions that McCain and Palin are encouraging in these final days of the campaign. He echoes some of the things he said in his famous 2004 DNC speech about that fact that there is no Red America and Blue America, there's a United States of America. We're all real Americans, and we're all "pro-America." Just because people oppose the policies of Bush and the very similar policies proposed by McCain doesn't make them any less American or patriotic than those who support those policies. At the other end of the spectrum, the McCain campaign has resorted to its own brand of terrorism, attempting to scare voters into ignoring our real problems and to focus instead on fear, fear that Barack Obama is "not who you think he is." I spent yesterday at an Obama office in New Hampshire calling voters, some of whom told me that they have already been receiving nasty "robocalls" from the McCain campaign. McCain also has a new mailer - the cover says "Terrorists don't care who they hurt," opening up to a large photo of Obama with the words "Not who you think he is." It's as insane as it is disgusting. John McCain is said to be "absolutely" proud of this line of attack. So much for his promise to run a respectful campaign, and for his memories of the hurtful robo-call attacks on him and his family in the 2000 campaign. In the past, I thought of John McCain as someone I could live with as president, someone I might disagree with on issues, but who was at least an honorable man. Clearly those days are gone. As one writer put it, McCain placed his principles in a blind trust at the start of his campaign against Obama. He also seems to have lost track of his judgment, as he showed in his choice of Sarah Palin and in his various responses to the financial crisis. Of course such vile attacks are business as usual for the GOP. They worked for George Bush, and they will probably sway some voters this time. That's why I and many other volunteers for Obama are continuing to reach out to swing state voters to tell the truth about what Obama represents - true concern for our middle class and poor people, and policies that will rebuild this country starting with jobs, new energy and education policies, and strong but non-belligerent foreign policy (among other things). I picked up a couple of books for my space/astronomy outreach collection today. One is a nice Q&A format picture book for ages 5-9, Extreme Planets! (2008, part of a new Smithsonian "extreme" series including dinosaurs, aircraft, and even "Extreme White House!"). There are 20 questions on planets and other solar system objects, and the answers are brief but reasonably detailed, with a web link to more in-depth material on each answer page. It's up to date on Pluto and other dwarf planets and the illustrations (mostly NASA photos) are great. It includes a glossary, index, references, and a "meet the astronomer" interview with Christine Pulliam, public affairs specialist at the Harvard-Smithsonian Center for Astrophysics (though she is not credited as the author). This is a good introduction to the solar system for curious young readers. Here's an interesting opinion piece in the Christian Science Monitor by Larry M. Bartels of Princeton University. Ignoring for the moment that he's an east coast Ivy League university professor and almost certainly one of those elitists you hear about, there's some fascinating data in his article about unemployment and real income growth under Republican and Democratic presidents, and how this relates to the economic plans of McCain and Obama. You might remember that things were pretty good economically under President Clinton - 22 million jobs were created, unemployment and inflation were low, and there were federal budget surpluses. Clinton presided over the longest economic boom in U.S. history. Looking further back, since the late 1940's, unemployment has averaged 4.8% under Democratic presidents, and 6.3% under Republicans. Whether these economic results are the direct or primary result of each president's actions is hard to say - it's a complicated thing - but the fact is that by and large, most Americans have done better economically under Democrats. Bartels notes that the economic plans of Obama and McCain are in most respects typical of their respective parties, though as you know, "past performance does not guarantee future results." Recent GOP performance has not exactly inspired confidence, and McCain basically offers more of the same, with policies weighted toward high income earners and big business. Although Eisenhower and Carter are exceptions, it looks like misery loves Republicans, but it's hard to tell because of the different numbers of years served. So I put this into an Excel spreadsheet and calculated a weighted average misery for Dem vs. GOP, the sum of (misery)*(years in office) for each, divided by the number of total Dem years (25) or GOP years (35). The average Democratic misery index is 8.9, while the average GOP index is 9.8. Here's an article (courtesy of New Scientist Space) that looks well beyond November 4 - about a billion years beyond. Starting in about 5 billion years, the sun will evolve into a red giant star and its outer gas shell will eventually engulf the Earth's orbit. But long before that, in 1.1 billion years, the sun will grow 11% brighter, raising average Earth temperatures to around 50 degrees C (120 degrees F). This extreme "global warming" will make life on Earth nearly impossible, although SPF 1000 sun screen will help. The article mentions mass evacuation of the Earth - billions of rocket launches. Not very practical, but I assume if we survive that long, we will have long since developed space elevators or other more efficient space transportation methods. We would also need to have terraformed Mars or made other living arrangements in the outer solar system (space settlements of some sort). The article concludes that a better plan might be to move the Earth itself to a more distant orbit, maybe out around Mars (the hotter sun will make up for the increased distance). Sound challenging? It is, but there are at least two conceptual ways of doing it, though either method would take a very long time, as well as technical capabilities that don't nearly exist. So it's a good thing we're planning ahead! Of course bad stuff could happen well before then, so we better keep working on space technology. If I still have any regular (or irregular) readers who are interested in space, Orbiter, astronomy, books, and education, you may be wondering: where is that stuff? Has this turned into just another political blog? The short answer: temporarily, yes. As I write this on October 20, we're just over two weeks from a very important election that has been absorbing a lot of my time, attention, and energy in support of Barack Obama. The result of this election will affect many things, including science and technology policy, education, energy, and more. So I'll be continuing to write frequently on political stuff (and occasionally on other stuff) until the election. After that, I expect politics to fade back to its normal, truly occasional level. In the meantime, if you're interested in Orbiter (202 articles), astronomy (182), NASA (175), books (152), Mars (119), space history (92), or many other topics listed on the side bar, I hope you'll browse my archives which date back to October 2005. Yesterday I read about General Colin Powell's endorsement of Barack Obama, but I didn't see the video until this morning. His explanation of his decision and his description of Obama as a "transformational figure" were great. 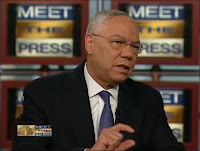 Powell is a Republican "soldier/statesman" who has served three Republican presidents, and in spite of his role in promoting the disastrous Iraq War when he was George Bush's Secretary of State (which he regrets), he is known and respected by many Americans of all parties. I'm also troubled by, not what Senator McCain says, but what members of the party say. And it is permitted to be said such things as, "Well, you know that Mr. Obama is a Muslim." Well, the correct answer is, he is not a Muslim, he's a Christian. He's always been a Christian. But the really right answer is, what if he is? Is there something wrong with being a Muslim in this country? The answer's no, that's not America. Is there something wrong with some seven-year-old Muslim-American kid believing that he or she could be president? Yet, I have heard senior members of my own party drop the suggestion, "He's a Muslim and he might be associated with terrorists." This is not the way we should be doing it in America. Like so many others, I was greatly moved by this, and grateful that Gen. Powell used his national position to make this important point (the photo he refers to is here). Obama is not a Muslim. He's an American who happens to be a Christian. And while it's sad that you even have to make a point of this, Muslim-Americans are Americans too. I was looking around iTunes U for free educational videos to put on my iPod to support my space/astronomy outreach work. I found some great space stuff, but I also noticed some other (temporarily) free stuff. 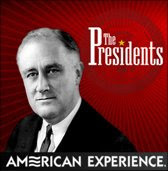 The PBS program The American Experience has been running a series of in-depth biographical films on U.S. presidents called, logically enough, The Presidents. They have made six of the complete films available as free downloads on iTunes U through Inauguration Day. The six available subjects are FDR, Truman, LBJ, Nixon, Carter, and Reagan. I downloaded all of them to my portable hard drive for eventual viewing on my PC and/or iPod. I've been watching part 1 of the FDR show and it's excellent. You can also watch the full programs online at program's web site (including one on George H.W. Bush that is not available at iTunes U). Lounge of the Lab Lemming is hosting the seventy-fifth outing of the Carnival of Space. Check it out. Last weekend I finished an interesting SF book, Bloom by Wil McCarthy. Published in 1999, it's essentially a "nanotechnology run amok" story, taking place in the 2100's. The people in this story are the survivors of a catastrophe that took place some 20 years earlier, when self-replicating nanotechnology systems somehow gave rise to "technogenic life" which then proceeded to devour virtually everything in the inner solar system. These "mycora" (so named because the early versions apparently resembled some type of fungus and reproduce by sending out "spores") do not seem to be intelligent, but their "blooms" are persistent and fast growing. Thanks to well-developed space and nuclear energy technology (see, we do need it), a few humans manage to escape the Earth and have retreated to settlements on the moons of Jupiter (deep underground) and in hollowed-out asteroids. The mycora don't do well in extreme cold, so the outer solar system is relatively safe, though spores somehow still manage to get to the human bases, which are protected by nanotechnical "immune systems" (the part of humanity living in the Jupiter system is called "the Immunity"). There is great fear that the mycora will evolve ways to deal with the cold and to overcome the Immunity's defenses. So a space mission to the dangerous inner solar system (or "Mycosystem") is launched to set up an early warning system, and most of the story takes place on board the Louis Pasteur during this perilous journey. The strange thing is, the narrator is essentially a blogger. There were no bloggers per se in 1998 when this was written, but in the computer-immersed culture of the Immunity (people routinely wear immersive VR glasses called zee-specs), John Strasheim is more or less a video blogger. He has a day job as a shoemaker (! ), but he is noted as a sort of freelance journalist, and is drafted to join the crew to document the mission for the folks back home on Ganymede. It's a pretty good device because excerpts of his reports fill in details of the problems and technology of the time so you can understand what's going on. As a space-obsessed blogger myself, I liked the idea of this guy being plucked from obscurity and sent on a space mission (I'm ready, NASA! ), even though the mission was hardly a picnic. The book works better than it might sound from my description - the characters are pretty good, the technology is well described and quasi-plausible, and there are some real surprises in the plot. An interesting sideline in the story is the resemblance of the mycora to cellular automata, and specifically to Conway's Game of Life, which becomes a sort of obsession for Strasheim (I'm guessing it was a major inspiration for the book). I've played with Life a bit in the past, and there are many versions of it if you are interested, including a Java version that requires no installation (screen shot shown here, button at upper left of that page). 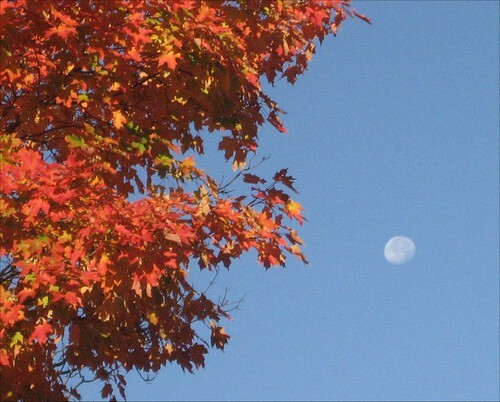 It's a gorgeous New England autumn day today, and after walking the dog this morning, I went back out for a couple of shots of the colorful leaves and the clearly visible waning gibbous moon. John McCain and Barack Obama appeared together last night at the 63rd annual Alfred E. Smith Memorial Foundation Dinner in New York, a charitable fund raising event with a tradition of humorous speeches. In their speeches, McCain and Obama each poked fun at his opponent as well as at himself, and I have to say that while Obama's speech was very funny, McCain was the winner of this event. The debates might have been more favorable to John McCain if he had appeared as relaxed and natural as he did in this speech. Each of them spoke for about 15 minutes. The video above is part 1 of McCain's speech (part 2 is here). Obama followed McCain (part 1 and part 2). You can see that both McCain and Obama do indeed have a sense of humor, and it's great to see it on display here, in spite of the tough campaign and the current economic crisis. It's also a great thing about our system that whatever their differences, even in the midst of a hard-fought presidential battle, that they can appear together like this and even praise one another in their speeches - and that it sounds sincere. Politics can be a dirty business, but it's clear that each of these men cares deeply about this country. I've been continuing to make phone calls to New Hampshire for the Obama campaign, and I'll be going up there to canvass again this weekend. While I've been dismayed by the negative campaign that McCain and Palin have been running, I've decided to follow Obama's lead, by trying to stay positive and just doing my small part to help. The American people can see that the McCain campaign is avoiding the issues with its ugly personal attacks on Obama, and I guess McCain's people can see that too, since McCain and Palin seem to have reduced the intensity of their attacks in the last few days (though the ads and surrogates continue full force with the lies and smears). But the polls show that the attacks are not helping them - it's the economy, stupid. I was also pleased to learn that the three most recent Nobel Prize winners in the sciences are endorsing Obama, specifically for his positions and plans for the sciences and education, which have really taken a beating under the anti-science Bush administration. They have joined 62 other American Nobel science winners in adding their signatures to an open letter (PDF) to the American people that was issued on September 25, 2008. The video here is by Dr. Martin Chalfie of Columbia University, one of the new winners in chemistry. Although the video quality is poor, his explanation of why he supports Obama is excellent. This year's presidential election is among the most significant in our nation's history. The country urgently needs a visionary leader who can ensure the future of our traditional strengths in science and technology and who can harness those strengths to address many of our greatest problems: energy, disease, climate change, security, and economic competitiveness. We are convinced that Senator Barack Obama is such a leader, and we urge you to join us in supporting him. The picture above is from a New York Times interactive feature showing the main features of Russia's venerable (but still active) Soyuz spacecraft. The Soyuz is in the news because the latest private "space flight participant," Richard Garriott, finally got his $30 million chance to ride one to space on Sunday, along with American astronaut Michael Fincke and Russian cosmonaut Yury Lonchakov (they docked with the ISS today). Garriott's web site has full information on his flight and activities for his 10 day mission. Air & Space Magazine did an interview with Garriott in March. The interactive feature is a sidebar to an excellent article on the Russian space center "Star City." Star City is a home away from home for American astronauts (and the occasional space tourist) training to fly with the Russians to the ISS. And assuming the shuttle is retired in 2010 as planned, it will be the one and only gateway to the ISS until (perhaps) 2015 when NASA's Orion spacecraft is expected to become operational. If things continue to go well for SpaceX, astronauts may be able to fly to the ISS on their privately developed Dragon spacecraft before 2015, though there is still a lot of development ahead. 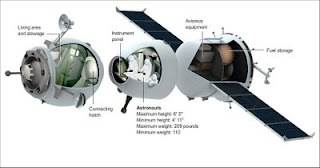 There will certainly be some ISS flights of the cargo version of the Dragon first, maybe as soon as 2012. P.S. For more in-depth information on the Soyuz, check out the Soyuz section of Kosmonavtka, Suzy McHale's excellent site on Russian space flight. In recognition of NASA's 50th anniversary, the November 2008 issue of Air & Space Magazine has a feature on NASA's 50 best photos of all time. 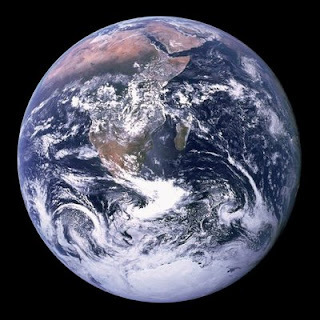 Number 1 is shown here - the famous "blue marble" Earth photographed in December 1972 by Apollo 17. The photo gallery (starting with #2) is available online here. Check out Carnival of Space #74, now available at Kentucky Space. I Am The Walrus is one of John Lennon's odder songs, and certainly a Beatles classic. But what does it mean? Perhaps a little set theory can help us decipher it. I found this chart on GraphJam.com, a site that uses business and mathematical charting tools for subversive and sometimes hilarious purposes. You can even make and submit your own charts. I just got one of my occasional email announcements from NASA on new or revised educational materials. This one included a link to an updated educational guide called Adventures in Rocket Science. 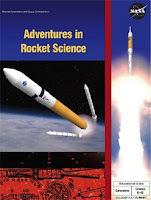 It's a 178 page PDF that starts with some background and history on rockets (including a section on NASA's next generation Ares rockets). It then goes on to present instructions for 25 rocket-related science experiments of varying difficulty and complexity, from a balloon thrust experiment to parachutes to rocket altitude tracking (with templates for making an altitude tracking scope). Looks like fun stuff (educational too). They also announced three additional teacher guides from 2005-2006, Space Math I and II (grades 7-9) and Space Math III (9-12). These guides present math problems based on space radiation, solar storms, star count estimates, Doppler shift, and much more - complete with answers. 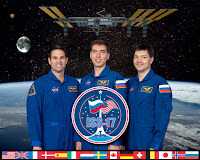 A couple of months back I wrote a post about how you could submit questions to be answered by astronaut Greg Chamitoff, a member of the Expedition 17 crew on board the International Space Station (Greg is on the left in this crew photo). I happened to check back just now and noticed that Greg had answered two weeks worth of questions, apparently back in August (since one of the questions referred to the Beijing Olympics "going on now"). He didn't answer my question (it was about time sense or "jet lag" type effects), but he answered some interesting ones. Topics ranged from the orbital mechanics of docking, to hallucinations (none), haircuts (possible), space vs. underwater habitats (he has spent some time in one), to the behavior of flames in zero-G. And that was just week one. His answers are quite detailed yet down to Earth (figuratively speaking). What is not mentioned in the Q&A is that Chamitoff is the first crew member to have taken bagels to the ISS. Eighteen sesame seed bagels, my personal favorite. Wikipedia never fails to inform! Here's a brief but very good article from OSA's Optics & Photonics News (OPN) on the final servicing mission for the Hubble Space Telescope and what it's expected to accomplish in terms of HST's astronomical capabilities. STS-125 was scheduled to launch next week but was recently pushed back to February 2009 or later because of the recent failure of an important piece of HST's data communication equipment. Since this is the final mission, they decided to delay it so that a replacement part could be prepared, and so the astronauts can practice to add this additional task to their already full mission schedule. 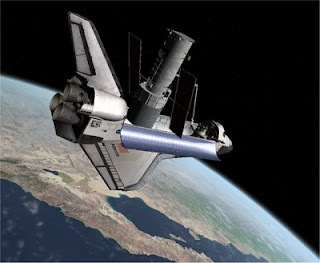 I've written before about STS-125 and have even done some simulations of it with Orbiter (picture above). It's an important mission and worth waiting a little longer to make sure that HST will be ready to give us another five or more years of scientific results and beautiful images of our universe. The real John McCain is apparently quite different from the image he and his backers try to portray - "outsider," "country first," "maverick," and all that. 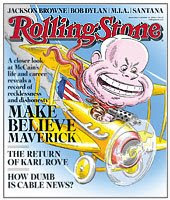 A new investigative article in Rolling Stone is based on discussions with people who have been close to McCain, from Annapolis classmates to fellow Vietnam POW's to fellow senators. There are many examples that illustrate McCain's poor judgment, hotheadedness, and willingness to compromise anything as long as it benefits John McCain. The picture that emerges is clearly "McCain first," not "country first." There's also a short piece on how McCain's positions have changed on many issues. P.S. As you can see from my electoral-vote.com widget, the Votemaster's latest poll-based projection gives Obama 349 electoral votes. Cool! But even cooler is this week's projection on the Republican-leaning electionprojection.com site: Obama 364, McCain 174! The Votemaster's site has a lot of interesting background information too. Check out this article on the correlation between "experience" and "great presidents" (as rated by historians). Basically there isn't any correlation. I've added a new temporary widget to the top of my side bar. It shows projected Electoral College results for Obama and McCain. It comes from electoral-vote.com, a web site that projects electoral college results (as well as Senate and House results) based on analysis of a wide range of polls. He has Obama as substantially ahead in projected electoral votes as of today (338 with 270 needed to win). The "Votemaster" claims to be unbiased in his statistical analysis, but if you doubt this, he suggests that you can look at a similar site run by a "rabid Republican," electionprojection.com (this site also has Obama in the lead, but with only 273 electoral votes as of today). Of course the only poll that counts is on election day, but it's still interesting to see how the race is shaping up in this crazy electoral college system of ours! On a brief driving vacation to New Brunswick and Nova Scotia, we got to make a side trip to a 300 million year old tropical forest. Of course it’s a fossilized forest, but we were able to closely examine part of a large cross section of sedimentary rock that is literally teeming with fossilized remains of plants and animals. This is from the Carboniferous Era (359 to 299 MYA, million years ago) when most of the world’s coal was produced. 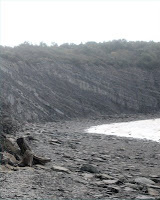 The site is the Joggins Fossil Cliffs, and it was recently declared a UNESCO World Heritage Site. The exposed layers at Joggins represent a period between 310 and 300 MYA. Joggins, Nova Scotia is a small village near the head of the Bay of Fundy, which is famous for its very high and very fast-moving tides. 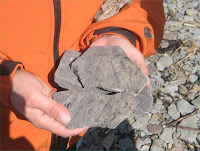 The tidal action wears away layers of the seaside cliffs, continuously exposing and releasing new fossils. It first came to wide scientific attention in the mid-nineteenth century. 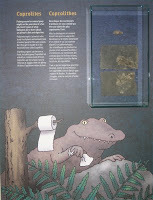 The famous English geologist Sir Charles Lyell (a friend and colleague of Darwin) and Canadian geologist Sir William Dawson visited the site and discovered fossils of amphibians and of the some of the earliest reptiles here in 1851 (the Carboniferous Period was of course many years before the dinosaurs which lived 220 to 65 MYA). We didn’t see anything as dramatic as a reptile skeleton on the cliffs or on the beach, but we did see sections of preserved tree trunks and roots as well as some mollusk shells, fern leaves, a very large fish scale, and some coprolites (fossilized poop!). We might not have known this except for a helpful staff member from the brand-new Joggins Fossil Centre who was collecting samples on the beach. We learned more from visiting the Centre where many of the best fossils collected over the years are on display along with excellent interpretive displays. It was pretty lucky the way the small land creatures were fossilized. Joggins had a lot of tree-like plants whose large trunks contained a spongy core. When the area was flooded and the settling sediment surrounded them, the cores would rot away, while the tougher “bark” would endure, eventually becoming coal. The tree shells were left in a standing position, and small animals would get trapped inside these hollow cylinders, allowing sediment to fall on them, which would sometimes preserve their bones as fossils. We are also lucky that the glaciers only left a 6-7 meter layer of debris on top of the present cliffs and did not completely scramble the 300 million year old layers below. I visited another World Heritage site today, Old Town Lunenburg. This charming village on the south coast of Nova Scotia used to be a fishing center and a ship-building town, though now it is mostly known for tourism and art galleries. Alice's Astro Info has sent a 50th birthday greeting to NASA this week. Actually it's the Carnival of Space #73 with a not-so-hidden message. Check it out. I love this graphic from the scientifically oriented comic strip xkcd. Using a log scale (something you don't see every day in a comic strip), it compares the "height" of everything from "folks" to the Andromeda Galaxy and beyond. There are also a lot of funny little annotations if you zoom in close. Thanks to Orbiting Frog for the tip! 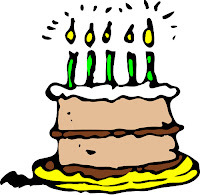 Happy birthday NASA! The space agency began operations on October 1, 1958. Watching this 50th anniversary video with commentary from so many notable figures in the history of the space age (even Neil Armstrong! ), I am reminded again of how much my life and career were influenced by the US space program, especially the parts I witnessed on TV and in LIFE magazine as a kid in the sixties. I can trace my interest in science, math, flying, and computers to those exciting missions. I first started paying close attention on John Glenn's 1962 orbital Mercury flight, and by the time Gemini was flying in 1964-1966, I was devouring "NASA Facts" and everything else I could find, and I considered myself an expert (at the age of 12) on space and aviation. I was sure I would have a space-related career, though I ended up working with computer software and optics instead. Now I'm a 50-something "space kid" who plays with space flight simulators and gives educational talks on space and astronomy as a volunteer JPL Solar System Ambassador. I never really lost the space bug. NASA has truly been an inspiration to me as it has been to so many others. Congratulations on 50 amazing years in space!